If you think American politics is dirty consider some of what happened in Ireland's presidential race this weekend. The Irish Mail ran a story splashed across its front page reporting that a forced sexual encounter had been reported involving one of the main candidates. The alleged incident was reported to a police station last week. When you read the fine print however, it turned out to be something else entirely. The person reporting the 'crime' admitted he had only 'third hand' knowledge of the encounter. Not even second hand mind you, but third hand, someone told someone who told him. Probably while they were all sitting on bar stools. And that it happened over 25 years ago but he was only reporting it now. The police, rightfully, dismissed the allegation out of hand and stated they were taking no action. Yet it ended up as the main story in one of the top selling newspapers. The other main story involved whether also-ran candidate Dana knew or did not know whether her Iowa-based niece had been sexually assaulted by her brother, who is now her campaign manager. Dana bore most of the responsibility for that but the media coverage was wall to wall and it was very hard to distinguish what it had to do with the presidential campaign. 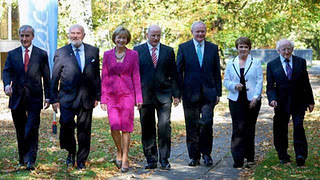 We have already waded knee deep through the sexual proclivities of David Norris, the Dublin senator who was accused of being supportive of pedophilia at a time when he was leading the race. No candidate seems immune. Martin McGuinness has been portrayed as Hannibal Lecter in much of the media, ignoring totally his massive role in ending the Northern Irish conflict . The Vichy version of history being peddled has the IRA as the sole instigator and purveyor of violence in Northern Ireland. It is no wonder that the one candidate who has not been smeared ---yet, -- Sean Gallagher, is comfortably leading the race. No doubt that will change in the ten days or so left. It is an incredible turn of events for an office that symbolizes dignity and patriotism, as exemplified by its last two occupants, Mary Robinson and Mary McAleese. We think it can sink no lower --- but let's watch this space.